Decided to make a few sympathy cards for Karen's Card Shop (collected by Susan Rahaila). I usually buy sympathy cards because I don't want to send anything that reeks "arts and crafts project by a woman with a lot of time on her hands and not enough talent". So I tread carefully here, selecting soft colors, a simple design, and no bling. Used Altenew Watercolor Wonders (lining up those layers is not easy), and a sentiment from an old Papertrey Ink set, Botanical Silhouettes. The cardstock is custard by Memory Box. Inks by Altenew. MOOD WHEN DONE = Learned that two women with whom I went to high school died this week. I did not know them well, yet it struck hard. These are so beautiful. ...love the custard base. I sometimes wonder if people think the same of me... and my cards... you know the "lots of time and not enough talent" thing. Your cards are beautiful. And you have lots of talent. I hear you about the "reeking of arts and crafts" thing. I'm rarely happy with the sympathy cards I make. Frankly, most of the cards I make these days... something needs to change, sigh... These cards don't reek at all. They're absolutely beautiful and look like something I'd buy because I love them so much. Very pretty on the custard card base. I like the feel of Memory Box card stock. These are beautiful, Joan. Thank you so much for supporting Karen's Card Shop! These will sell very quickly. You NEVER make arts and crafts project cards. You make art, my dear! Simply beautiful...love everything about them. And yes, you are an artist! Your cards are lovely. I enjoy and look forward to your posts. I tell people (and you),"Don't believe everything you think". The one thing I agree with you is on keeping sympathy cards simple. I disagree with you on your statement "arts and crafts project by a woman with a lot of time on her hands and not enough talent." You are loaded with talent, my friend. And besides, I personally think that handmade cards say "I care enough to make this for you." My two cents. 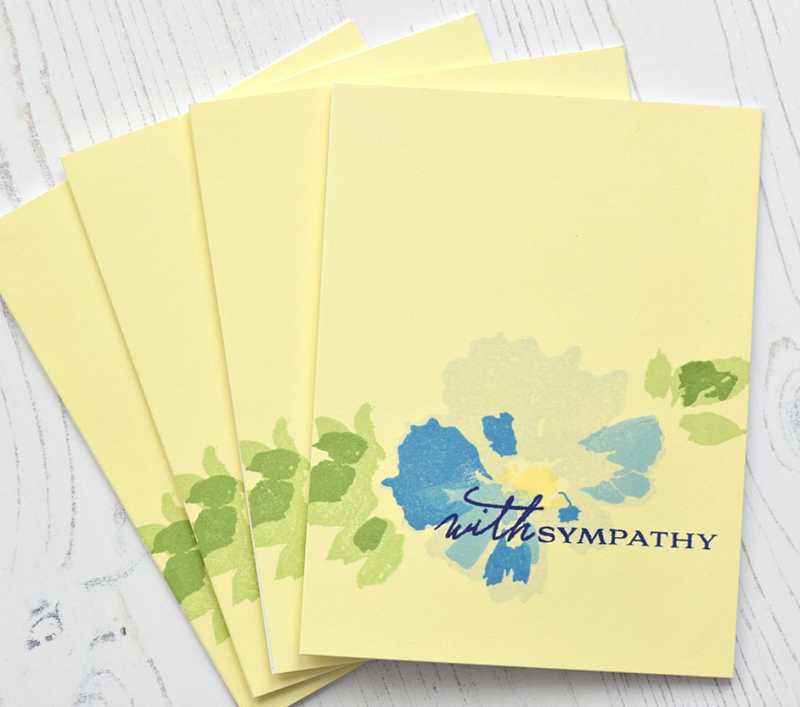 Sympathy card are looking very good and the color of these cards increase their beauty. Every person color selection is different but your collection are awesome.